“I left the former government showing my opposition to fraud and corruption, and formed a new government. Is it to continue the same frauds and corruption I ask you? It is true that UNP supporters voted for me, and I owe my gratitude to them. Are the UNP members attacking me to frighten me? Or to chase me out? I do not know whether they are doing these things with a purpose or others leading them to do such things. I walked out that day ignoring the risks I would have to face. Therefore this type of criticisms is not something new to me. Some UNP members are going round saying that the Bond Commission was appointed in order to attack the UNP. I appointed the Bond Commission in order to probe the Bond issue. I have no personal issues with anyone ...” so said President Maithripala Sirisena recently. I am sure there is a basis for his anger. However, any misappropriation of state funds becoming corruption depends on what purpose the money was used for. Throughout history we have seen political leaders illicitly using states funds, but using such money for implementation of radical political projects had never been approved by any democratic assembly; yet history had given positive verdicts. That established the rule - end justifies the means. That is why we caution any over determination on the findings of Bond Commission. Just because the operation is illicit it does not become a crime. In politics such actions become crimes, if money is used for personnel and private family purpose or kept secretly hidden for such purpose. In the period 2008 to 2014 that happened very prominently; state funds were used not only for private purposes, but also for fascistic murders and cruel repression. The general appeal today is, not to use present Bond Commission report for political campaigns. Lankans manipulated by racist politicians, have taken to the rule of the jungle and survival of the fittest has become the norm; what all such rulers could do was to suppress the masses who make protests, resulting in two uprisings from the economic minorities in the South and a bloody civil-war in the North that extended to East between the national and social minorities, all against the state. Today, a new mindset is needed to move away from the present extremely selfish, a deadbeat education system where students are tutored only to get through exams. Instead we must create a holistic generation that is encouraged to think outside the box. Not only should they depend on the internet but also by absorbing the world around them to look and learn. Some suggest achieving this by changing the school curriculum to follow the Yala and Maha crop cycles, instead of the unrelated school holidays, that would give youth the chance to feel and smell the richness of the earth! Their future for Lanka lays solely in a high-tech, scientifically confirmed, chemical fertilisers free, bio-sustainable food production from agricultural science applied farming methods. According to them, another area not well exploited by the people is the resources around them in the sea and below in the island nation. For generations Lankans have allowed other countries, particularly India to pouch into this unlimited ocean wealth while poverty has increased in the land over the same period, having missed golden opportunities to explore the ocean resources to their benefit. The fishing sector is in need of proper management for country is still importing fish for consumption. They say these are the things that should be discussed in this island-wide Local Government election. The Local Governments election campaigns are on and voting is close by. This time without preferences and ward orientation compulsory, no doubt eager political and social elements will enter politics from all parties. As political parties have fielded their candidates in a hurry, there is a chance that many fools or unfit candidates too would have received nominations to get elected to this bottom level of power. But by nominating such persons as candidates, the parties are doing a disservice to the people for they cannot put an end to the corruption, money rackets and even nepotism present in politics today and will not get the voters to breakout of the trapped incompetent backward feeling. Much worse; it is such fools and unfits who are easily moved into racist, fascist political tendencies. They become famous politicians by shouting against minority communities. On the other hand, take the cases of the people in the northeast; for example the presence of excess Sinhala soldiers, the failure to free more Tamil land held by the military and the failure to abolish the Prevention of Terrorism Act. These are all particularly detrimental to the restoration of normalcy in this region. However, this grievance of being trapped in impotent feeling, as shown above is not specific to the northeast or to the Tamil people, although they are the most vocal about the failings of the government to deliver on its promises. Clearly the complaint regarding the slowness of the government is more widespread. 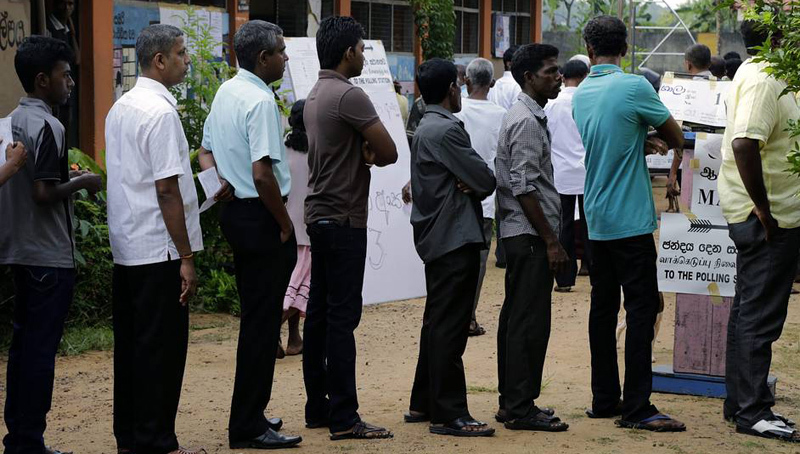 In Lanka all those who voted for the government to ensure that there would be good governance, expansion of democracy with a constitution acceptable to all communities and economic prosperity from all over the country are dissatisfied with the progress that has been made so far. They see the failure of the government to take those accused of corruption, abuse of power and racist fascistic oppression to trial and to prison, as indications of infirmity of those who may do the same in the future. On the other hand, the less political, larger population whose main priority is to improve their standard of living and get out of the poverty traps they are in, are disappointed that the government has patently failed to jump start the economy. Some bourgeoisie economists demand that Lankans must accept the reality that the country as a whole is not generating enough wealth and it had been the main cause for disintegration of them into smaller groups divided by regions based on nationality and religions; while the majority dominating the minorities due to the folly of the past leaders who were stupidly hero- worshipped by the people. This is putting the cart before the horse. It is the development under Capitalism that created nationalist consciousness that was misdirected by parochial political leaders. There were vulgar racists in the past who advised people to boycott elections as it happened at the first Provincial Council election in 1987 and later years at the 2004 general election and the whole world knows the consequences. In 88-89 the JVP led the racist campaign against devolution, parity of languages and citizenship for upcountry Tamils. They killed many people and in the end bourgeoisie state carried out a repression where nearly 40,000 disappeared. In 2005 election boycott by Tamils gave the opportunity to Mahinda Rajapaksa to win. He destroyed the Tamil liberation and finally established a fascist regime. Today too there are theoreticians who advise people to go to polls and spoil their votes at the oncoming Local Government elections. To any sensible person it should be clear that there is no sense in wasting votes; but time is ripe now for Lankan people to shatter this barrier in their mind and break out of the trapped in feeling of incompetence, to select the right candidate to represent them at this lowest level of power, in the journey for national unity and democracy. An excellent analysis, although the Author does not have a PhD in Political Science. His PhDs are in Engineering and Mathematics. Yes, many things in life are unfair. I don't have a single PhD, but this guy has two! I've chased away the UNP guys who came asking for my vote. Neither the SLFP nor the SLPP (of the Rajapaksas) is contesting my Municipality. Instead, there is an Independent group that "claims" to be genuine SLFP. Their symbol is a wrist watch. I'm not voting for such unknown qualities. The leader (and now Mayoral candidate of this group was once the UNP Mayor). No, they will not get my vote. I agree with Bahu that we must not spoil our votes. So, I think that I'll vote for the JVP.